Following a tender process, Renault Trucks has been selected for the first time to supply Reading Borough Council with ten replacement vehicles for its 240-strong fleet. 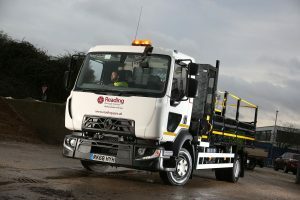 Beating off competition from four rival manufacturers to win the contract, and achieving the highest evaluation score across all of the criteria, Renault Commercials in Reading has delivered seven Range D12 tippers, with a D16 tipper grab, D18 tipper and C2300 18t gulley sucker on order. The Range Ds join Reading Borough Council’s highways and drainage team, carrying tarmac for road surfacing work including drop kerbs and fixing potholes across the Borough. Fitted with Optitronic 6AS 800 automated gearbox and automated clutch, the D12s have six forward and one reverse gear, with operation mode control and gear selection at the steering wheel.